The Intelligent Programmable Pump from FMI is a compact stepper with programming software which allows the user to program the pump via a Graphical User Interface (GUI). The new "Intelligent" Pump comes with integral programmable driver electronics. It is ideal for analytical and process instrumentation. FMI's New Brushless DC Pump is a fixed displacement pump ideal for wash and fluid transfer in medical and analytical instrumentation. 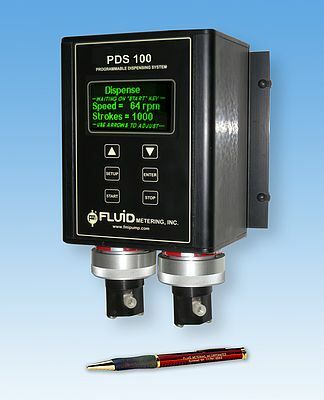 The PDS-100 Programmable Dispenser section has been expanded to show the many diverse single and dual channel pump configurations available.